The other major Post-Impressionist (with Vincent van Gogh) who painted many landscapes with trees was Paul Cézanne. In contrast to van Gogh’s obvious visual appeal and huge popularity today, Cézanne’s paintings are more difficult. They lack the sophisticated technique of Pissarro, and for many have less aesthetic appeal. However Cézanne’s work, including his depiction of trees, is the greatest single influence of nineteenth century painting over modernism and art in the twentieth century. It is therefore worth the effort of appreciating them better, even if you may never come to effuse or enthuse over them in the way that you might over van Gogh’s cypresses. Paul Cézanne (1839-1906) was born and brought up in a prosperous banking family in Aix-en-Provence. He was a close schoolfriend of Émile Zola, who went on to be a leading novellist, journalist, and writer. In preparation for an intended career in the family bank, he studied law at the University of Aix. However he was determined to be a painter, and left University prematurely, travelling to Paris in 1861. In Paris he started to paint, including copying at the Louvre, as was normal at that time. During the 1860s his paintings were generally very dark, and he experimented with painting using a palette knife. Subjects were also dark, and sometimes violent. He painted at the Académie Suisse, and met Hortense Fiquet, a part-time model, who became his partner. On the outbreak of the Franco-Prussian war in 1870, the couple fled to l’Estaque, close to both Marseille and Aix, where his paintings continued to become more light. When they returned to Paris the following year, he befriended Pissarro, who acted as his mentor, painting in company plein air in villages along the River Seine not far from Paris, particularly in and around Pontoise. As a result Cézanne painted many landscapes in Impressionist style. From 1878 he returned more often to Aix, which was his base from the early 1880s until his death. His style moved on from Impressionism, and in 1886 he married Hortense, his father died leaving him a wealthy man, and his friendship with Zola ended abruptly. He was diagnosed a diabetic in 1890, and Hortense and his son largely lived in Paris, leaving Cézanne to paint obsessively back in Provence. There his principal subjects were his Bathers series, landscapes, particularly around the Bibemus quarry and views of Mont Sainte-Victoire, and still lifes. He submitted regularly to the Salon, his paintings being included in the Salon des Refusés in 1863, and rejected each year until 1882, when one of his paintings was finally accepted. He did exhibit in the first (1874) and third (1877) Impressionist exhibitions, but it was not until 1895 when the dealer Ambroise Vollard ‘discovered’ him and gave him his first solo exhibition. Cézanne continued to paint largely in complete isolation, although some artists visited him on the strength of his growing reputation. He died in Aix, his wife and son still in Paris, in 1906. Cézanne did include depictions of trees in his paintings prior to his Impressionist phase, but they are relatively infrequent, painted fairly simply, very dark, and when worked using a knife (in his couillarde style) a strictly acquired taste. Paul Cézanne (1839–1906), La Route tournante en sous-bois (The Bend in the Road Through the Forest) (c 1873), oil on canvas, 55.2 x 45.7 cm, Solomon M. Guggenheim Museum, New York, NY. By kind courtesy of the Solomon M. Guggenheim Museum, via Wikimedia Commons. Cézanne’s early Impressionist paintings are light, high chroma, and worked briskly with broad brushstrokes. Accordingly his trees have quite solid canopies, with gesturally-marked trunks and branches, where the latter are visible. Although he used a range of colours across foliage, more subtle effects such as the textural differences between species are not apparent. 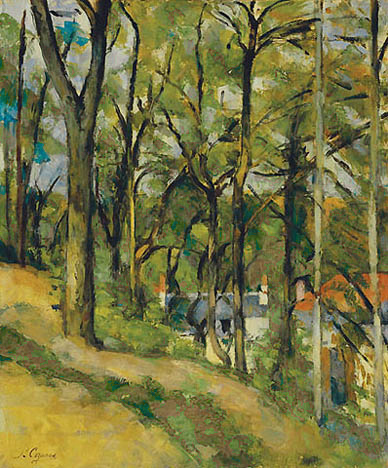 Paul Cézanne (1839–1906), La Côte Saint-Denis à Pontoise, (c 1877), oil on canvas, 66 x 54.5 cm, Museum of Fine Arts, St. Petersburg, FL. Wikimedia Commons. There are a few instances where corresponding paintings by Cézanne and Pissarro have survived, where it appears probable that they were painted in front of the same motif and at the same time. One of the best-known pairs is Cézanne’s La Côte Saint-Denis à Pontoise (c 1877) above, and Pissarro’s Côte des Bœufs, Pontoise (1877) below. I apologise for the former image being so small: it is the only suitable copy which I have been able to locate. Both paintings use grillage, which I have argued is a technique most characteristic of Pissarro, although Cézanne used it occasionally throughout the rest of his career. Cézanne shows little or no anatomical basis to the construction of his trees, whose branches are only loosely related to foliage, whereas Pissarro presents us with an essay on the form and structure of trunks and branches. 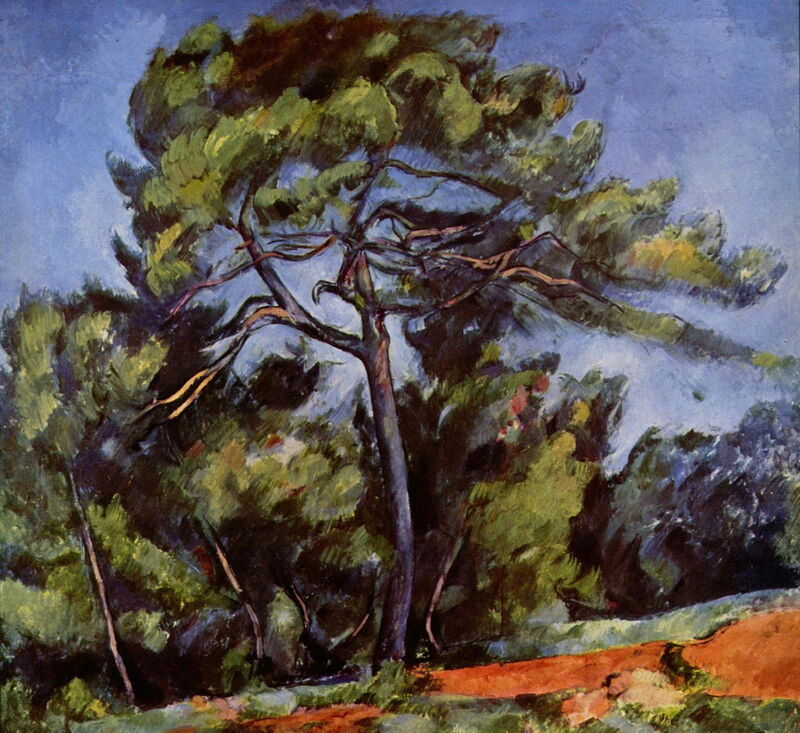 Cézanne simplifies throughout: he shows little or no texture, and more basic shadows, on the trunks, and the foliage is depicted as amorphous areas of leaf colour. Pissarro captures texture in everything, from the smoother surface of the track to the smaller branches. 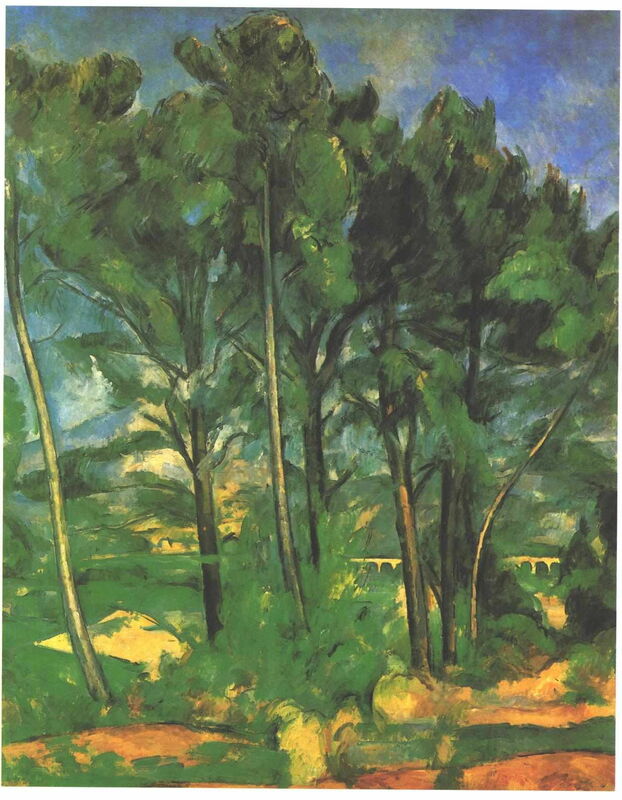 Although there are some apparent errors in depth order (where more distant branches are shown crossing in front of more proximate trunks), Cézanne’s painting has similar cues to depth as those of Pissarro’s. 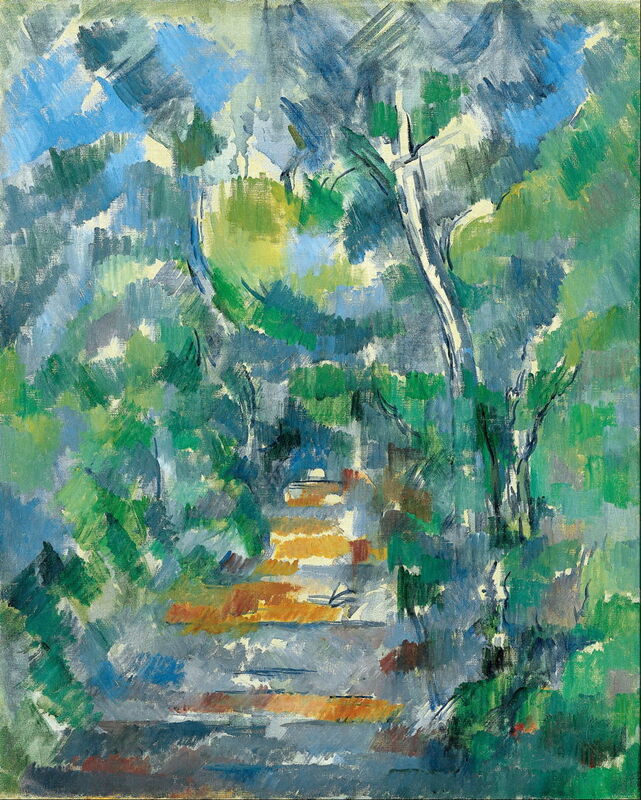 Towards the end of his Impressionist phase, Cézanne’s brushstrokes ceased following the form and structure of the canopy (as with those of Pissarro and van Gogh), and started to become organised in what has been termed ‘the constructive stroke’ (as discussed by Reff and others). 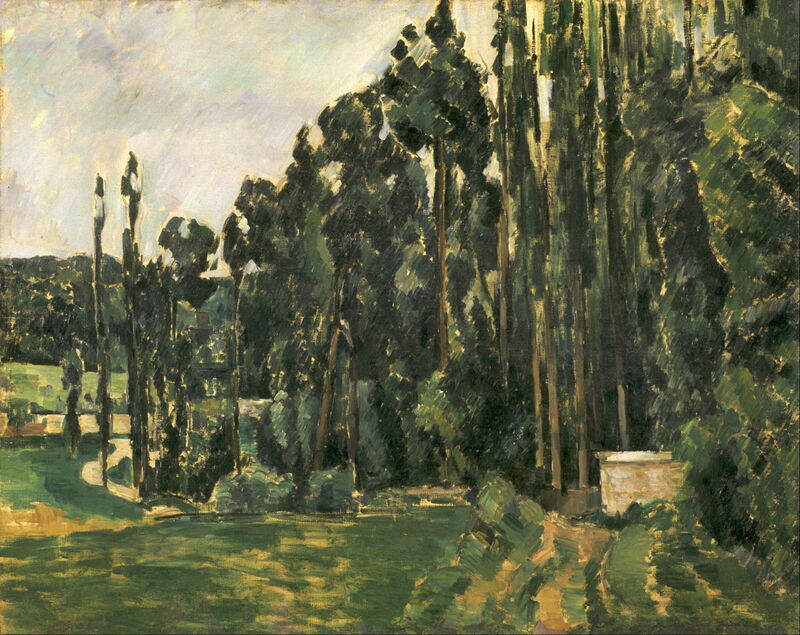 These Poplars (1879-80) show extensive use of this technique, which is almost characteristic of Cézanne, and pervades his landscapes from the early 1880s on. At this stage, he has used different orientations of brushstroke (as shown in the foreground), but most of those used for the foliage of the poplars is diagonal, at approximately 45˚, irrespective of the underlying form. This gives these canopies a very solid appearance, which is again only loosely reflective of the underlying anatomy of the tree. He has also reduced the range of tones and colours used in the trees, and there is no aerial perspective. Paul Cézanne (1839–1906), Le Clos normand (Hattenville) (Farm in Normandy) (1882), oil on canvas, 50 x 65 cm, Albertina, Vienna. Wikimedia Commons. This dense canopy of trees seen at a Farm in Normandy (1882) are again assembled using the ‘constructive stroke’, with greater variation in tone, but keeping similar hue. 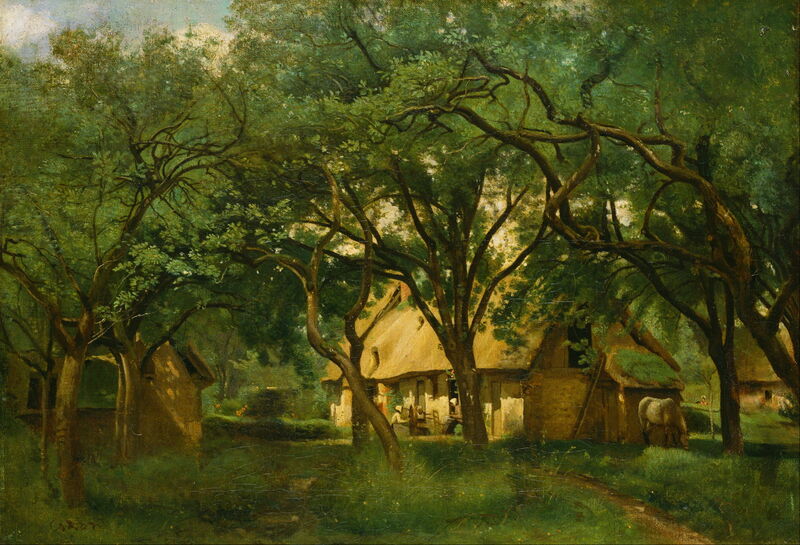 This painting has an unusual composition which appears to have taken grillage, as in Corot’s The Toutain Farm, Honfleur (c 1845) (below), to its ultimate conclusion, where the farm does not peep out from the foreground trees, but is almost completely obscured by them. 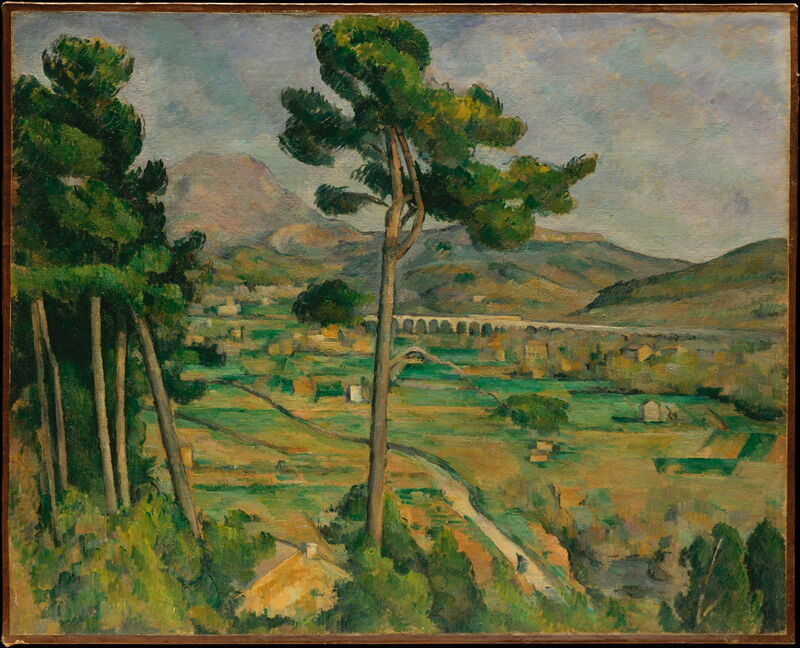 For the final twenty years of his life, Cézanne was obsessed with a number of motifs around Aix, most prominently views of Mont Sainte-Victoire to the south-east of Aix. Several of these paintings of the mountain feature trees, although in most cases they are used to frame the motif in repoussir. However, in this version, Mont Sainte-Victoire, View from Montbriand (1882–85), one tree has escaped and positioned itself to form a midline to the painting, framing the mountain in the left half, and the long railway viaduct in the right. The trees are constructed typically for his mature style, with relatively featureless and texture-free trunks, and solid canopies built using the constructive stroke. Paul Cézanne (1839–1906), Arbres et maisons au lieu dit “La Duranne” (Trees and Houses, Provence), (c 1885), oil on canvas, 60 x 81 cm, Nasjonalgalleriet, Oslo. Wikimedia Commons. 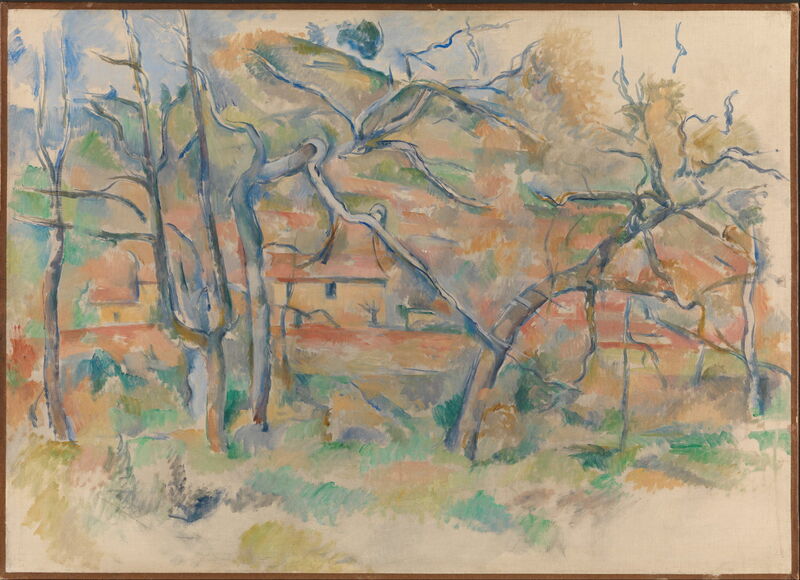 Another line of works developed by Cézanne in these later years, in Provence, probably culminating in his watercolours (see below), is of clusters of trees, in grillage in front of another motif as here, or in woods in the countryside around Aix. Trunks and branches, which are often twisted and contorted into peculiar forms, are drawn in using a dark ultramarine blue, and filled with washes of various colours. Foliage, other vegetation, and more distant objects are then assembled from small, irregular blocks of colour. Those blocks usually show the constructive stroke, but with the brushstrokes much less prominent within them. Paul Cézanne (1839–1906), Les Marronniers du Jas de Bouffan en hiver (Chestnut Trees at the Jas de Bouffan in Winter) (1885–86), oil on linen, 73.3 x 92.5 cm, Minneapolis Institute of Arts, Minneapolis, MN. Wikimedia Commons. Cézanne also painted many views of the family mansion at Jas de Bouffan. This motif combines that with a view of Mont Sainte-Victoire in grillage. The barren trunks and branches of the chestnut trees are almost black, with the grass at their foot marked out with horizontal brushstrokes. 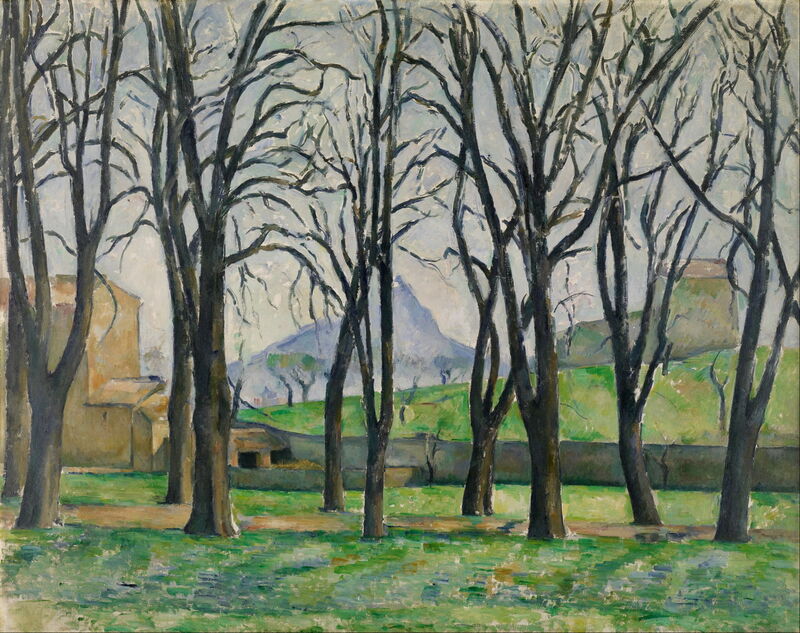 Paul Cézanne (1839–1906), Les Arbres du Jas de Bouffan dénudés (Bare Trees at the Jas de Bouffan) (1885–86), oil on canvas, 60 x 73 cm, National Museum of Western Art, Tokyo. Wikimedia Commons. 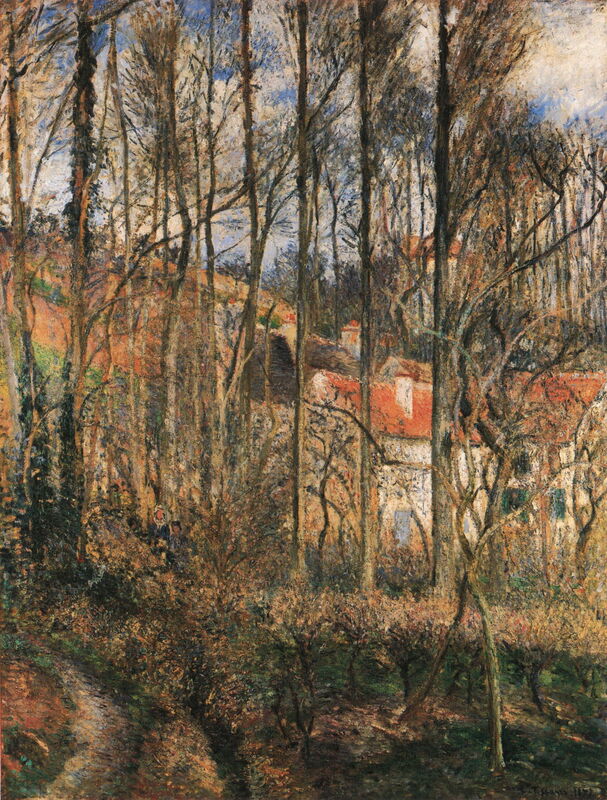 This variant on the same theme has been painted even more roughly, the trees resembling some of Pissarro’s early sketches, such as Apple Trees at Pontoise, the House of Père Gallien (1868). Paul Cézanne (1839–1906), Le Grand Pin (The Great Pine) (1887–89), oil on canvas, 84 x 92 cm, Museu de Arte de São Paulo, São Paulo, Brazil. Wikimedia Commons. 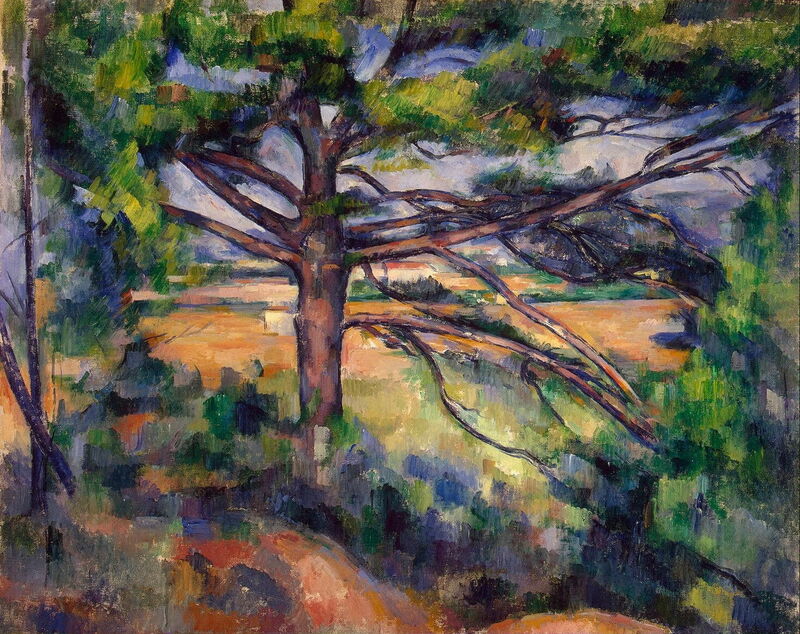 Cézanne painted relatively few portraits of individual trees, but this Great Pine (1887–9) is among his best-known. The trunk and branches are drawn in dark (probably ultramarine blue) outline, then painted in with more attention to texture and shadow. The canopy has visible and quite thick brushstrokes which are orientated according to form rather than being constructive strokes. Paul Cézanne (1839–1906), Montagne Sainte-Victoire et viaduc du côté de Valcros (Mont Sainte-Victoire and the Viaduct of Valcros) (c 1890), oil on canvas, 91 x 72 cm, Pushkin Museum, Moscow. Wikimedia Commons. This painting, of Mont Sainte-Victoire and the Viaduct of Valcros (c 1890), is often omitted from examinations of Cézanne’s Mont Sainte-Victoire series, as the mountain and the viaduct are barely visible through the dense grillage. 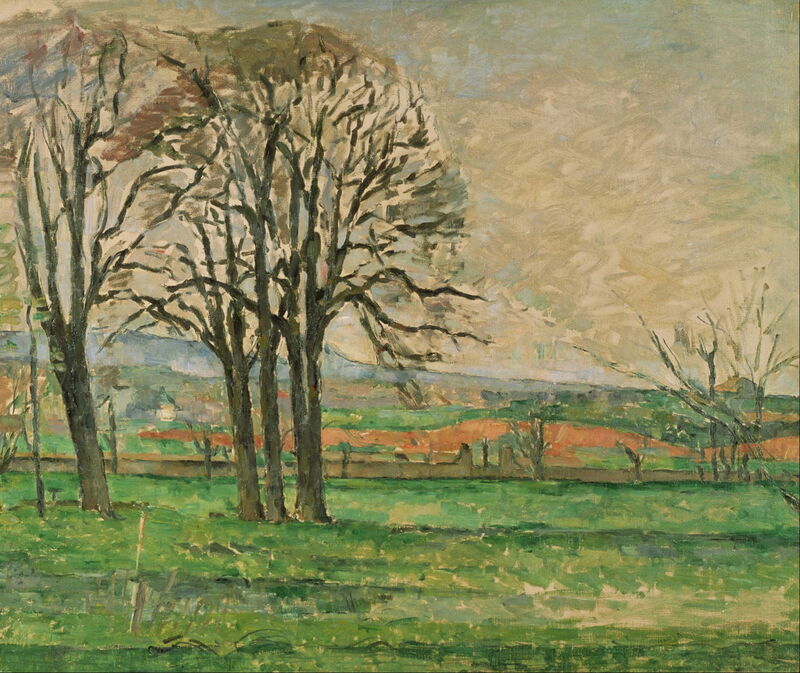 Depiction of those foreground trees follows his mature style, but with little evidence of the constructive stroke. After his Farm in Normandy (1882), this must be Cézanne’s ultimate development of grillage. It is also noticeable how little correspondence there is between the canopy as painted, and the underlying anatomy as shown in the branch structure. Cézanne’s constructive stroke became more prominent and started to dominate the structure of his oil paintings after 1890. In Large Pine and Red Earth (1890–5) it was used throughout the foreground foliage and vegetation, and even started to appear in some patches on the trunk. 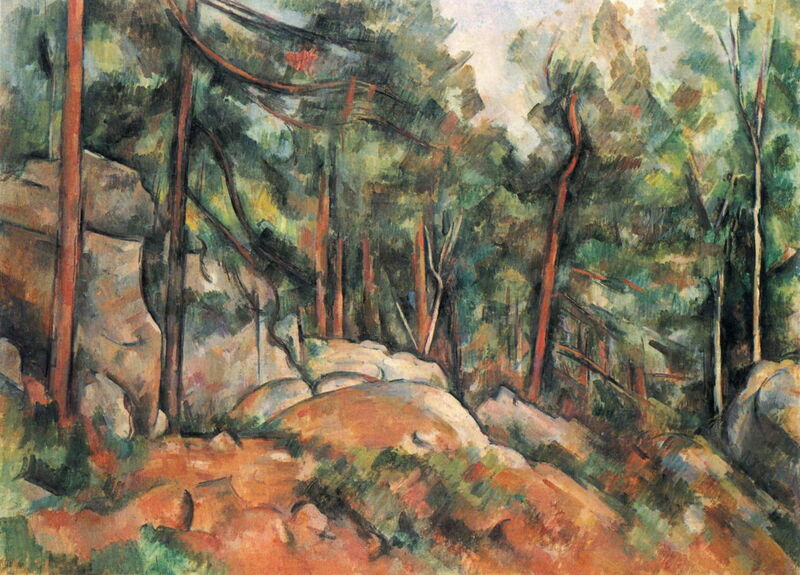 Paul Cézanne (1839–1906), Intérieur de forêt (Forest Interior) (1898–99), oil on canvas, 61 x 81 cm, Fine Arts Museums of San Francisco, San Francisco, CA. Wikimedia Commons. In the final few years of his career, branches became almost dissociated from the structure of the foliage, which was largely determined by patches laid down using the constructive stroke. 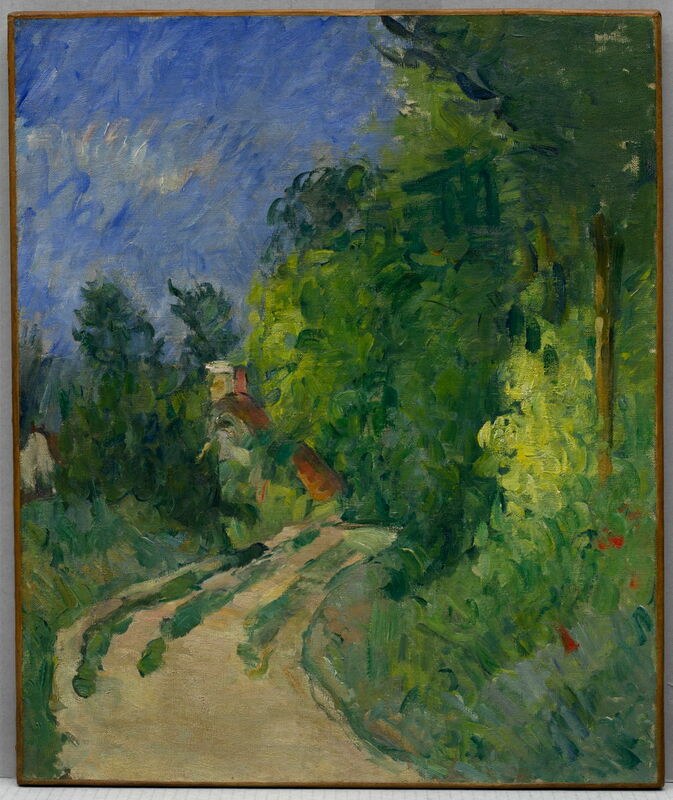 Although many have seen this as increasing abstraction, Cézanne remained adamant that he was continuing to strive to paint his sensations; the meaning of this word in French is somewhat broader than in English, but it was also used by Impressionists including Monet, and was by no means unique to Cézanne. It is also interesting that, despite expressing the same intent as had been common to Impressionists long before, Monet, Renoir and other Impressionists moved in very different directions to those of Cézanne. The common goal was reflected in contrasting results. Nor had Cézanne apparently arrived at a consistent technique in his quest to express his sensations. Over these last years, he returned to painting watercolours in which there were very large areas of white space, with in this case Almond Trees in Provence (1900) being depicted using flares of bright colour. Although at first glance these watercolours appear quite unlike any of Cézanne’s oil paintings, there are several common features with his earlier Trees and Houses, Provence (c 1885). However I have yet to see a coherent account of his last decade which satisfactorily integrates his watercolours and oils. Cézanne’s final oil paintings are generally seen as precursors of Cubism and modernism, in that form almost breaks down completely, and the painting is dominated by patches of colour laid down using the constructive stroke, as seen in Wood (1900–2). The only indication that there are trees here are sporadic passages of drawn trunks and fragments of branches. 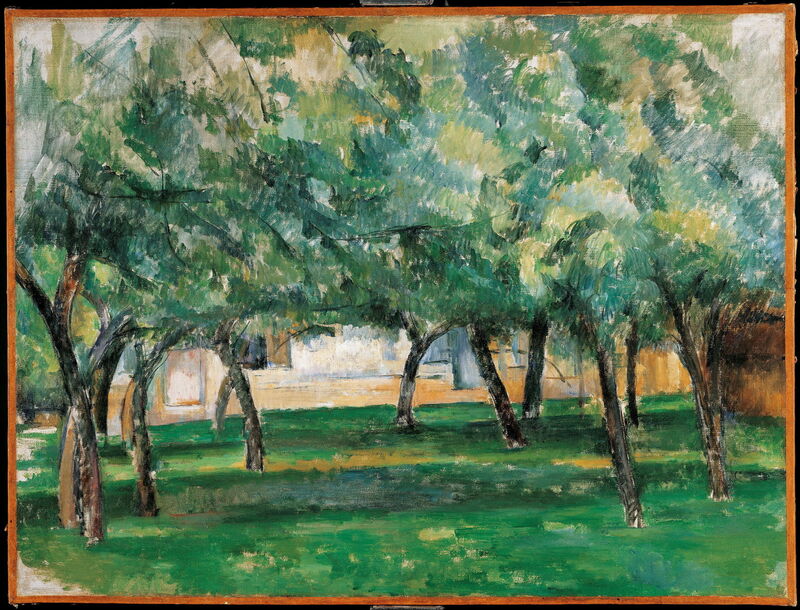 From his Impressionist phase, Cézanne painted many trees, although most were integral parts of the landscape. From the outset he depicted his trees in simplified form, with limited emphasis on their anatomical construction, and without the detail of textures. As his style departed from Impressionism, foliage was assembled from colour patches built using the constructive stroke, which came to dominate its form. Ultimately his oil paintings showed a breakdown in form, but his watercolours appeared very different. They used drawn outlines, with bright flares of colour within them. The profound puzzle here is Cézanne’s repeated insistence that he was painting from nature, and attempting to show the sensations which he felt from his motifs. Yet during the twentieth century, his paintings were interpreted as being abstractions, and inspired radical departure from representational art, by way of Cubism and later movements. We will never know exactly what Cézanne intended, but he certainly showed it in his paintings of trees. Buck S et al. (2008) The Courtauld Cézannes, Paul Holberton Publishing. ISBN 978 1 903 47084 8. Machotka P (2008) Cézanne, The Eye and the Mind, 2 vols, Editions Crès. ISBN 978 2 753 70047 5. Machotka P (2014) Cézanne: Landscape into Art, Arbor Vitae. ISBN 978 80 7467 049 7. Shiff R (1984) Cézanne and the End of Impressionism. A Study of the Theory, Technique, and Critical Evaluation of Modern Art, Chicago UP. ISBN 978 0 2267 5306 5. 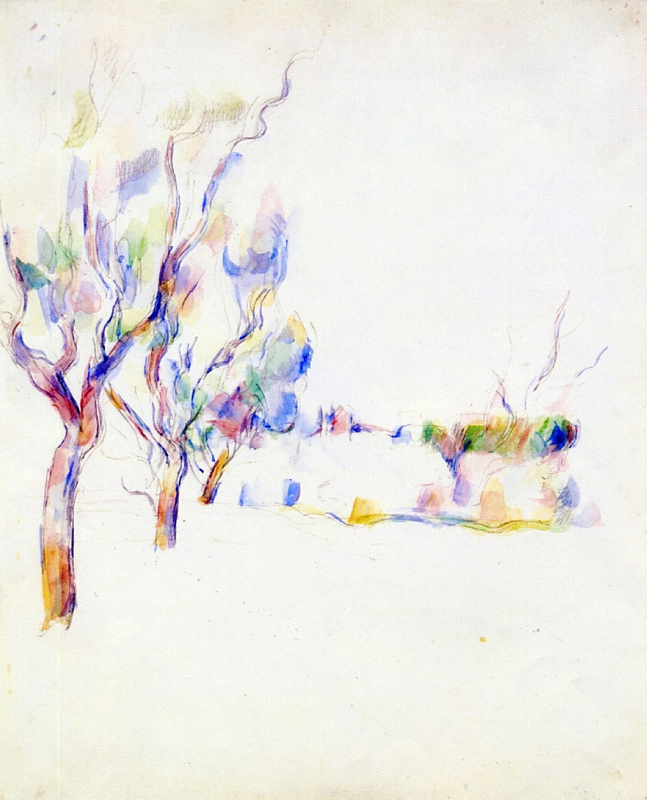 Simms M (2008) Cézanne’s Watercolors, Between Drawing and Painting, Yale UP. ISBN 978 0 300 14066 8. Smith P (1996) Interpreting Cézanne, Tate Publishing. ISBN 1 85437 171 1. Solana G (2014) Cézanne, Site / Non-Site, Museo Thyssen-Bornemisza, Madrid. ISBN 978 8 4151 1350 8. Posted in General, Painting and tagged abstraction, Cézanne, constructive stroke, Corot, Cubism, grillage, landscape, painting, Pissarro, plein air, trees. Bookmark the permalink.